Well that was...both interesting and completely expected in turns. This is a good show for ... well. Hm. Well, it's got a great plot spanning the entirety of it, which as I started to expect about episode 12, has been cut short by the anime's end. It feels like they didn't change or add frivolous bits to help with that though, so maybe this will get another season? Pros: Action'y cathartic good times with a strong plot to back up the catharsis. -The fights in this show are always a good time, and ultimately what I was there for as it continued on. -The characters...sometimes are trope'y, but when they aren't they're well made and interesting. I love Natsuki, myself. I need a gif of when she double fan slaps two people for addressing her as Chan. -The plots sound, well made. Maybe a little bit obvious, but I don't consider that a bad, or boring, thing. Cons: I, personally, feel unexpectedly underwhelmed. -When a character is set to fit into a trope, that trope never goes away. Kirasaka is slotted for the Tsundere trope, and while she acts outside of it in interesting ways frequently, I came to realize they were only interesting because she was the tsundere card. That's fairly annoying. Only a few other characters fit into this problem, but a problem it still is. -Things...are often very agonizing to watch play out, because they fit so obviously into a scenario you've already seen before and know how it goes, and ends. While it's interesting when the show breaks free from what they make you expect, they frequently just carry on regardless. Maybe most people won't even notice, and this is just a product of how much anime I watch, and the particular way I absorb the things I watch and read. -Don't expect anything phenomenally ground-breaking from the story. Particularly with the last arc, this show goes exactly how I imagined it would eventually end up, mostly from all the clues being dropped all over the place by various characters acting privately and in secret. This is very much one of those shows where you have a really good idea how it's going to end, but you watch it anyway because its still interesting to see how they'll do it differently from other people. My Opinion: It's a good show, I enjoyed it, and looked forward to it from week to week. Unfortunately, nothing I'd ever go back and re-watch, but if they make a second season, definitely something I'd pick up to watch, for sure. Impartial Judgement: This is a ... very "Anime'ish" show. The kind of thing that you see a lot of from the industry, and that tends to be the defining overall spirit of the vast majority that the anime industry puts out. It gives off the same feeling as things like Trigun, Dragonball Z, Naruto, Bleach, One Piece, those sorts of things. Ah, that's the word, Mainstream. It feels very mainstream. The kind of thing you'd have no qualms about passing down to the next generation of anime lovers, but that you'd only rewatch on a personal opinion basis. While I may have enjoyed all of the shows I listed, I personally, for instance, would be far more inclined to rewatch Trigun, Bleach, or DBZ, than One Piece or Naruto, even though I would still recommend them for watching to other people(except for naruto's fillers, which are usually garbage and agony to watch). 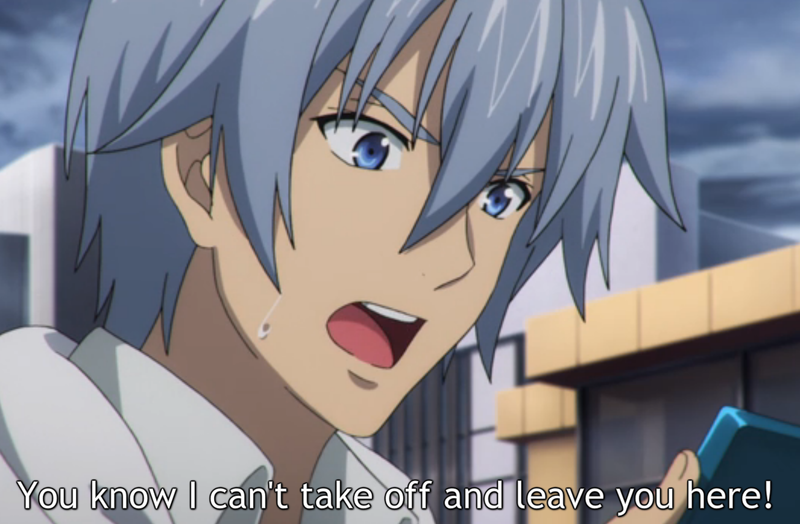 I feel like, while it does do interesting things a lot of the time, Strike the Blood still feels to mainstream'y to me, for me to otherwise be glowing about it. I get that feeling really, that I should have been more glowing about this show than I actually am, having just finished it. Usually, when I have a conflict of internal opinion-feelings like this, it means that most people will have much more polarized reactions. So this gets a Medium-Strength recommendation to watch. I won't harp about it to most people I greet, but I won't easily back down from supporting it either. At the end of the day, I watched this show more for the action, and Kojou showing off as the fairly dense but strongly moral main character. I watched it as an action anime. If you're at all interested, or completely put off, by an Action Anime, decide accordingly whether to watch this show or not.